The collected quantities of health-care waste increased after the adoption of the regulation governing this waste. Collected quantities of waste medicines are also expected to increase, since collection in pharmacies was introduced at the end of 2009. The indicator shows annual quantities of waste generated and collected in the health-care sector as well as the methods of its disposal. Health-care waste is defined as waste generated by health and veterinary services and related research. The list of waste produced in the health-care sector and the methods of its disposal are specified in the Decree on the management of waste generated by health and veterinary services and related research activities (Official Gazette of the Republic of Slovenia, No. 89/08). Examples of health-care waste include sharp objects, infectious waste and chemicals. The management of waste medicines is stipulated by the Decree on management of waste medicines (Official Gazette of the Republic of Slovenia, No. 105/08). Waste medicines comprise waste medicines generated in health-care and veterinary activities and related research and waste medicines classified as separately collected fractions of municipal waste. - To upgrade the disinfection of infectious waste with more effective thermal-treatment processes for non-hazardous waste and/or to substitute disinfection with incineration in incineration plants of hazardous waste. 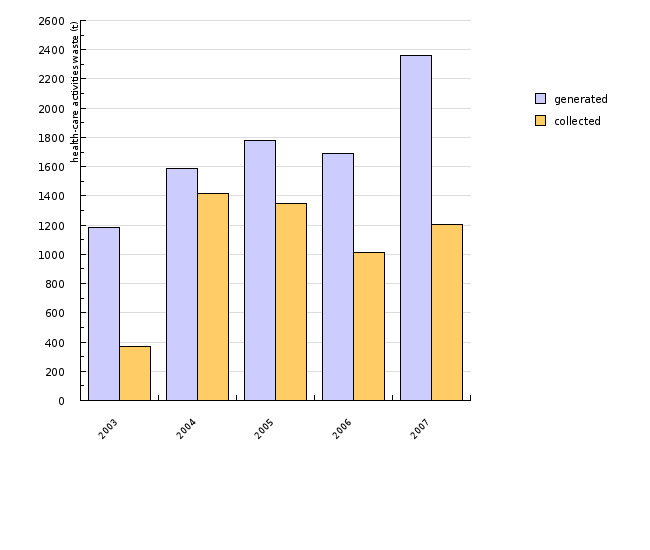 Due to modifications of the waste classification list implemented in 2001, comparisons of data on the generation and management of waste can reasonably be drawn from 2003 onwards. According to the Environmental Agency of the Republic of Slovenia, the generation of health-care waste has been on the rise in the past three years, resulting in an increased quantity of health-care waste which has been disposed of. 2,360 tonnes of such waste was generated in 2007, of which only 1,201 tonnes were collected. 2004 saw a notable increase in the quantity of health-care waste collected that year, which may be attributed to the newly adopted Rules. The discrepancy between the quantities of generated waste and collected waste is a result of liable entities failing to report their waste. Also contributing to the difference in quantities is a provision in the Rules on the management of waste which stipulates that reporting is required for those individuals who generate a minimum of 10 tonnes of non-hazardous waste or 5 tonnes of hazardous waste per year. No essential difference has been registered between quantities of disposed health-care waste in each year. Pre-treatment – disinfection of infective waste prevails among the modes of disposal, followed by depositing of waste which requires no special treatment. In accordance with the legislation, the generator of waste is obliged to secure that health-care waste is not mixed with other waste and that different types of waste generated in the health sector are not mixed with one another. The generator of health-care waste is further obliged to deliver such waste to waste collectors. Collection may only be carried out by entities which have obtained the relevant authorisation from the Ministry. Waste collector is obliged to provide for disposal of collected health-care waste in accordance with the currently applicable regulations. From among the modes of disposal of health-care waste depositing still prevails. 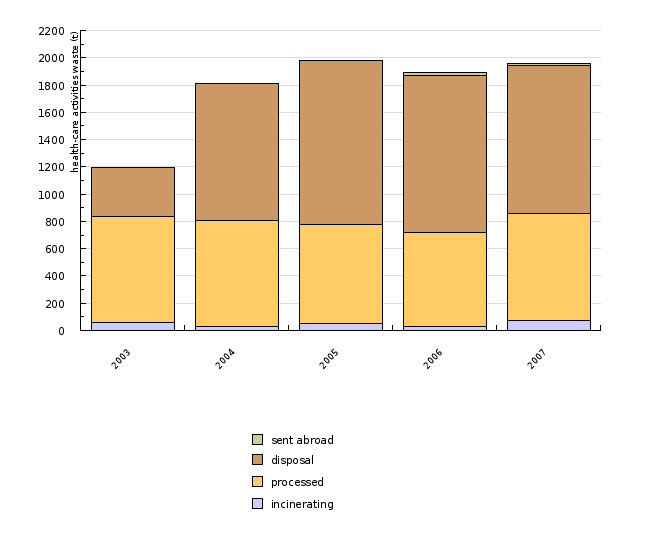 In 2007, 1,087 tonnes of such waste were deposited, 781 tonnes were thermally pre-treated, and 76 tonnes were incinerated. In 2007, we exported 16 tonnes of such waste. The objectives have been taken from the 'Operational Programme on waste deposition aiming at the reduction of deposited quantities of biodegradable waste' (Novelation, March 2008, page 50). Up to 2007, the indicator comprises data on waste subject to mandatory treatment in accordance with the Rules on management of waste generated by health services and related research activities (Official Gazette of the Republic of Slovenia, No. 47/04). 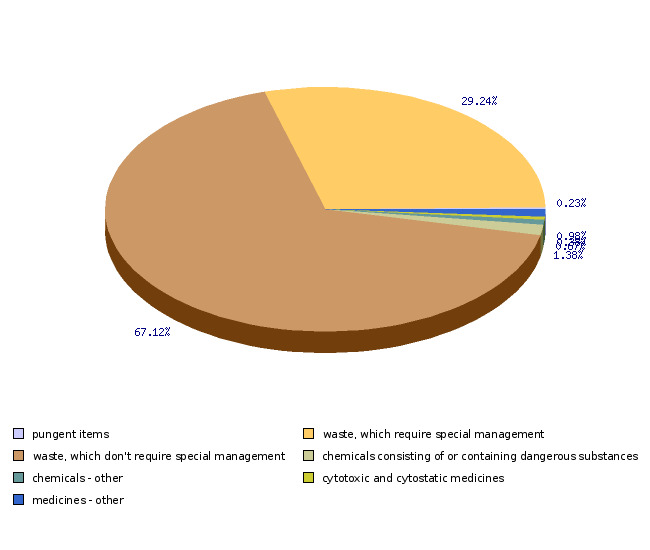 Data for 2008 contain data collected on the basis of the Rules on waste management of waste generated by health services and related research activities, and the Decree on the management of waste generated by health and veterinary services and related research activities, which became effective on 4 April 2008. Data on waste medicines will be collected on the basis of the Rules on management of waste generated by health services and related research activities, and the Decree on management of waste medicines which became effective on 22 November 2008. In 2009 and from that year onwards, the indicator will comprise data collected on the basis of the Decree on the management of waste generated by health and veterinary services and related research activities. Data on waste medicines will be collected on the basis of the Decree on management of waste medicines. • landfill operators who reported on deposited health-care waste.